When older adults have hearing loss, using the phone can become nearly impossible. If your older adult has been avoiding talking on the phone, that could be the cause. But telephones are an important source of safety and social connection. So, we found a special type of phone that solves this problem. It’s called a caption phone. Even better, internet-based caption phones and service are free for people with hearing loss through a program funded by the Federal Communications Commission (FCC). On a caption phone, the live phone conversation appears in easy-to read text on a large screen. Other than that, it works like a regular telephone – dial and answer calls as usual. Speak and listen using the phone handset like always. They’re helpful for people with hearing loss that affects their ability to use a standard telephone. It gives them a lifeline in case they need to call for help as well as keeping them connected to family and friends. 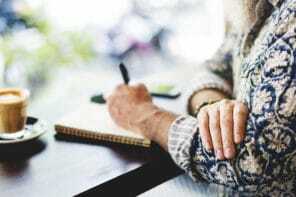 We explain why helping older adults keep connected is important for health and how seniors with hearing loss can get a free caption phone. Loneliness and social isolation have significant negative impacts on senior health. Feeling alone can increase the risk of depression, poor nutrition, cognitive decline, and more. 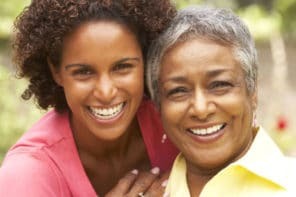 So, helping older adults with hearing loss connect with family and friends, like through the telephone, improves mental and physical health. To get a free caption phone, first choose a company that sells caption phones. To get a free caption phone and service, people with hearing loss must certify that they have a hearing loss that necessitates use of captioned telephone service. Companies that offer caption phones will be able to guide you through the qualification process. Typically, a form like this one must be completed and then signed by a medical professional or audiologist. There should be no additional charges for delivery and installation. A local trainer helps install the phone in the home. The trainer makes sure the phone works and teaches how to use it. The trainer will also complete the additional paperwork required by the FCC. Is this service or phone available in Ontario, Canada. This is a service that’s free in the United States for those who qualify because it’s paid for by the Federal Communications Commission (FCC). It’s possible that there are similar benefits programs in Canada. We’re not familiar with phone services in Canada, but it’s also likely that you could also purchase similar caption phones for use in Canada. Can this caption phone capture a Spanish conversation? Please send information by mail: 260 terrace Dr.
I’m sorry to hear that it’s been tough to find hearing aids that work for you. Your doctor or a qualified audiologist are the best people to make recommendations for your specific situation. We don’t sell any products and aren’t doctors or hearing specialists, so we aren’t able to provide any recommendations. I have a question: I have gone thru  sets of hearing aids and none helps my hearing. computer. What would suggest in your line of apparatus. hi can we purchase this phone and can work for another country? We don’t know the answer to that, but my guess would be no because phone systems are different across countries. You may want to give CaptionCall a call at 1-877-557-2227 and ask them. Sorry if this seems like an odd question, but I am not very familar with a caption phone? Does the person on the other end have to type an email to you, for you to get the captioning on your phone? How do you respond back? That’s a great question. Unless you had been told, you probably would never know that you were speaking to someone who is using a caption phone. A caption phone doesn’t require anybody to do anything different. You would call the person who owns a caption phone and speak as you normally would to anyone on any phone. The caption phone will translate your spoken words into written words, which will be displayed on the caption phone’s screen. That helps the person with low hearing to know what you’re saying when you call. They would then speak to you through the phone handset and you will hear their voice as if they were using a regular phone. I hope that clarifies things! I want to know first of all whether one has to have internet to make this phone function. Secondly, I would rather purchase the phone than jump through all the hoops to get a free phone. No one MOST IMPORTANT, must you have internet for this phone? This is an urgent questions. Hi Barbara — According to CaptionCall, this caption phone requires a high-speed internet connection in order to work. As far as we know, all caption phones require high-speed internet. You may want to give CaptionCall a call at 1-877-557-2227 to see if they have any options that don’t require an internet connection. There are captioned phones that do not require internet. CapTel makes some. That’s fantastic to know! Thanks for sharing. I hope they can help you get your voice mail set up quickly and easily. Enjoy the phone!